CnetSDK provides .NET programmers with a free-to-test barcode reader software, called .NET Barcode Scanner SDK. It is very efficient in barcode reading & barcode recognition from many image files. This .NET barcoding library supports most popular linear & 2D barcodes like QR Code, PDF-417, Data Matrix, EAN/UPC, Code 39, Code 128, etc. By integrating this barcode recognition library into your .NET imaging program, you can develop advanced barcoding project for your business or personal use. As an independent barcode library, this .NET Barcode Scanner SDK can be easily installed and integrated into your C# & VB .NET applications by simply adding Visual Studio project reference. No other .NET assemblies are needed. Using mature barcode scanning & recognition APIs, you may easily scan and decode barcodes from images in .NET Console Application, .NET WinForms, and ASP.NET web projects. The loaded image source can be a String, Stream or Bitmap object. Basically, this barcode scanner for .NET can read barcodes from common raster images, including BMP, PNG, JPG, JEPG, GIF & TIFF. If you want to scan and read barcodes from PDF document, you should firstly render PDF to image file formats in your .NET program and then implement barcode recognition. Most commonly used barcode types can be scanned and recognized by our .NET Barcode Reader SDK, including linear and two-dimensional barcode symbologies, namely QR Code, Data Matrix, PDF417, Aztec, Codabar, Code 39, Code 93, Code 128, EAN-8, EAN-13, UPC-A, UPC-E, and ITF-14. No matter you want to read all barcodes from a loaded image or define a specific barcode type to read & decode, CnetSDK .NET Barcode Scanner SDK guarantees you with highly accurate recognition. Please note, an image with poor quality or missing angle may have a bad influence on barcode reading. This .NET barcode scanning solution is capable of reading and decoding 1D and 2D barcodes with rotated angles. For linear barcodes, 0 and 180 degrees are supported. For 2D barcode QR Code, 0, 90, 180, 270 degrees are supported. You may firstly download free .NET Barcode Scanner SDK trial package online, and then refer to .NET Barcode Recognition Guide for how to scan, read and decode linear or 2d bar codes (like reading QR Code) from images in your Visual Studio .NET applications, like .NET Console Application, ASP.NET web form application, .NET WinForms application, and .NET Class Library. Moreover, Visual C# Program Coding Examples for Barcode Scanning & VB.NET Program Coding Examples for Barcode Scanning are provided online. Development requirement for using our Barcode Scanner Library for .NET is Microsoft Windows System, 32/64-bit, Visual Studio 2005 or above, and .NET Framework 2.0 or above. We also provide a demo project in the free trial package for your quick reference and evaluation. 1. 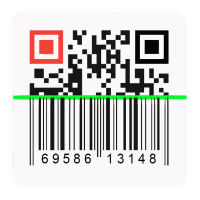 The first data value of each barcode will be decoded as CnetSDK* if you are using the free trial package. 2. If you need to read barcodes from PDF document, you should use CnetSDK .NET PDF Barcode Reader SDK. Three license types are provided for you to choose from, namely One Server License ($899), Group Server license ($1,499), Unlimited Server License ($2,599). Each of which permits the unlimited developer to use (copies of) CnetSDK .NET Barcode Scanner SDK to develop the unlimited number of derived works that can be deployed to 1, 2 to 8, or unlimited server(s) respectively. Please note, if your derived work is a single-user client application, the Group Servers License is required. And it grants you to use CnetSDK Software to develop and install unlimited (copies of) single-user client application to unlimited client desktop PC's. You may see more licensing details or make an order now. You may also search for CnetSDK .NET Barcode Scanner SDK use phrases like .net barcode library, .net barcode scanner library, .net barcode recognition, .net barcode api, .net barcode scanner api, .net barcode reader component, .net barcode reader library, .net barcode recognition decoder sdk, .net barcode recognition library, .net barcode reader open source, barcode reader online, barcode reader sdk, barcode decoder online, barcode recognition online, barcode recognition software, barcode recognition using image processing, asp.net barcode scanner, and .net barcode reader from pdf.